Us vs. Them | Life. Seriously? Funny! 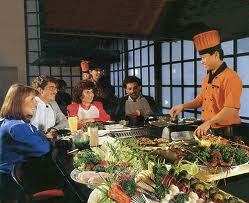 Imagine you’re at your favorite Japanese restaurant. As you are being seated you become aware of those who are at your table. Some have been there before; others are brand new to the experience. As the waiter comes and begins to take everyone’s order, the couple that has been to the establishment many times begins to insist everyone must have what they are having. It’s what they like and it’s best. Why would anyone want anything other than what is best? You can almost smell the fried rice! Now keep in mind, other than the obvious immature notion “everyone should be just like me,” everyone at the table is eating Japanese food. The banging of steel will enthrall everyone, the tumbling utensils and the “choo-choo trains” and “volcanoes” made out of the onion rings will cause “ooo’s and aaaah’s.” So if the only “difference” is personal preference—since everyone will eat Japanese food—why the insistence by the regular patrons that everyone must eat what they like? Welcome to “Sunday Worship Wars!” While every analogy eventually breaks down somewhere, this one is fairly accurate. If we assume for the moment (and yes sports fans, I do know what “assume” means to many) there are true believers in church who desire what God has for them, we must then begin to define our terms clearly—to avoid confusion and rancor if nothing else! First, what is church? The Bible is quite clear regarding who makes up the “universal” church: it is the “body of Christ” and is made up of all who have a relationship with Jesus Christ and the Father through faith in Christ. Our professed faith is evidenced by the way we live our lives: if we live like Christ, we are demonstrating the validity of our claim of faith according to James 2:17. So the Universal church are believers everywhere. Yet the local church—the koinonia or the local fellowship of believers—is comprised of those who are truly a part of the universal church and those who are not. The reason why there is this corpus permixtum (mixed body) is simple: while God knows and guarantees those who are part of His body, we, being mere humanity, cannot make the same guarantee. Having given a brief definition of “church,” let’s talk about its purpose or what the church is to be. One of the best definitions I have come across is this: “The church is to be the sign and instrument of God’s kingdom” according to Ed Stetzer, head of Lifeway Research. People should see the church as representative of God’s kingdom and the church (those comprising the body of Christ) are to be the instrument God has chosen to use to reach this world with the Good News of Jesus Christ! I am openly contemporary in my presentation as a pastor and in my musical preference. Yet my passion isn’t CCM (Contemporary Christian Music) or Traditional Hymns (which were part of “contemporary music” in their day and context). My passion is to communicate! God has granted me the ability and position to be able to communicate His Gospel and for me to communicate—period. He has given me an opportunity to serve Him as a pastor and as a communicator. I do not use the same verbiage, grammar or context with every audience. When teaching and preaching, I use the same message, but not the same style and words; I cannot because I desire to communicate the message God has given me to communicate—and to do it effectively with different audiences! Music is a tool. It is not God, it is not the message: it is the vehicle through which the message is carried. In my congregation, we overwhelmingly sing traditional hymns—partly due to the audience make-up, partly because of the skill-sets of the musicians—yet for our church to reach the lost and communicate with them in a means and manner they can comprehend, we will also need to change our methodology in the future—and thankfully, my congregation understands this! There is error in both the CCM camp and those who argue for Traditional Hymnody. This is not an “either/or” but a “both/and.” In Political Science there is what is referred to as a “zero sum game”—somebody wins and somebody loses. While there are contexts in this fallen, sin-ravaged world where this observation is valid, yet in the Kingdom of Christ it is invalid and heretical. When believers understand worship, they comprehend it is a 24/7/365 thing; it is not the hour or two on Sunday mornings or the quiet time spent alone with God. Worship is the life of the believer! If as Paul insists in Romans the “just will live by faith,” then all of life is worship! Jesus in John 17:22 in His High-priestly prayer on behalf of all believers, asks the Father “May they be one as We are one.” True, this verse has far too often been hijacked by the ecumenical movement, yet it is uniquely applicable here. We do not need to be perceived by the world, the lost, that we do not love or get along. We can be different and even Paul in Ephesians 4 highlights the necessity of unity in the midst of diversity within the body of Christ. Does your love of CCM bring you closer to God? It does? Praise the Lord! Does the organ enunciating the majesty of God in “How Great Thou Art” move you to tears and to aid in your understanding of God! May His Name be praised! It’s not an “us vs. them” thing; it is an “Us bringing them to Him” thing! Posted on February 18, 2012, in Uncategorized and tagged choo choo trains, japanese food, onion rings, personal preference, professed faith, worship wars. Bookmark the permalink. 1 Comment. I am in fact thankful to the owner of this web site who has shared this enormous piece of writing at at this place.